Very nice condition, appear to be straight, Couple of small scuffs. 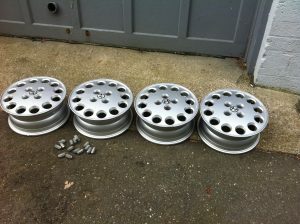 They came from a 92 series4, but will fit Quads or any other 105-115 Spider. Includes correct lug nuts 15×6 with 30mm offset.